Meteorologically speaking, it is an inconvenience that Louisiana oysters are never more delicious than they are right about now, just as we’re growing accustomed to the daily threat of something resembling winter. Wouldn’t it be nice if oysters were at their crispest in August instead, when they could provide cool relief from the blood-hot sun? Yes, that would be nice, but our reality is pretty sweet as well: oysters at their peak, tasting like clean ocean water, firm-fleshed and sitting pert on their shell. They’re perfectly sized, large enough to announce their presence, small enough to swallow whole. Get another dozen. It’s gift-giving season. According to the reports from the restaurants, the local crop is back to the quality seen before the big BP Horizon oil spill of 2010. Prices and supplies have normalized. Thousands of seafood samples collected during reopening and surveillance in the Gulf, as well as those obtained dockside and in the marketplace have been analyzed using [advanced] analytical methods. 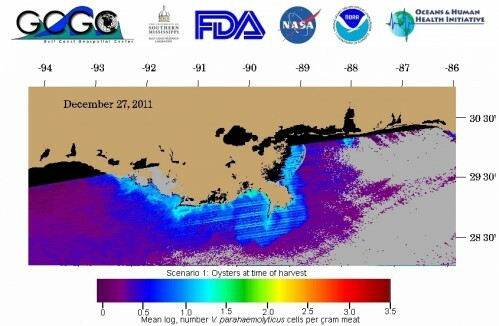 While chemical compounds associated with the oil spill have been detected in seafood samples using these various analytical methods, none were present in edible tissues at levels that approached levels of concern for human consumers of seafood products from the Gulf. Space-based monitoring of a notorious bacteria in seafood that can cause illness in certain disease-prone diners. Right now threat levels are relatively low in the Gulf, which, presumably, means good times in New Orleans for oyster lovers.